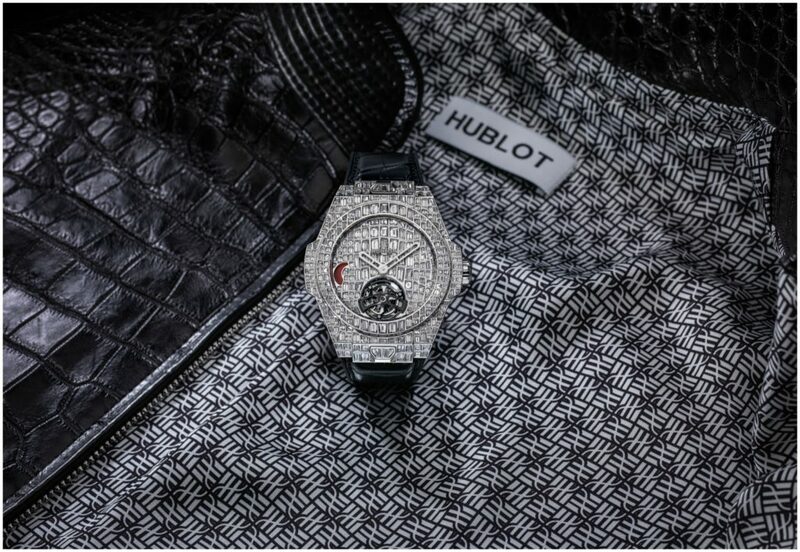 The Hublot Big Bang Tourbillon Croco High Jewellery – A set to surpass every superlative: Hublot is launching a Big Bang watch set with 13.5 carats of diamonds combined with a bullet resistant jacket made of crocodile leather. A million-dollar duo, custom-made for you! This incredible project, combining haute horlogerie, fashion, and cutting-edge technology, was made possible through a collaboration with the Karmaloog brand. Founded by Racho Bajadjan and Nezir Yozgat. They created the brand specialising in ultra-luxury garments and accessories, using the skills of the finest craftsmen, working with the most refined materials, and pride themselves on exceeding limitations. For this partnership, Racho Bajadjan, artistic director of Karmaloog, has created an incredibly stylish bomber jacket, cut from black crocodile leather. The Karmaloog brand carefully hand picks their leathers which are sourced from suppliers that guarantee the international animal protection laws are respected. 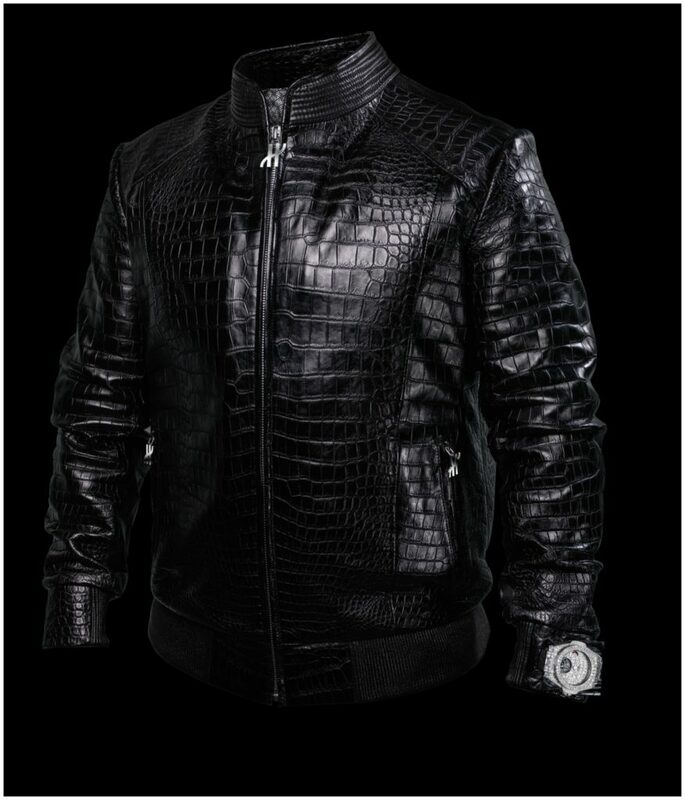 This highly fashionable jacket has been designed with a unique lining, a material developed using the latest technology to add protection without bulk it is called Carbon aramid fabric and made possible by multiple layers of finely woven carbon nanotube fabrics. This enables the jacket to withstand and absorb the impact of powerful projectiles*. The lining has then been covered in elegant screen-printed silk using Hublot colours. The ultimate in refinement, the various zip closures on the jacket can be customised by the wearer. A set of three jewellery sliders is provided for each zip closure: The main slider at the front is 18 carats white gold and paved with diamonds (39 diamonds totalling 0,88 carats) combined with a slider crafted in white gold and two side pocket sliders all in the shape of an H (for Hublot), these sliders are interchangeable with the recognizable Karmaloog sliders hand crafted in 18 carat white gold. Veritable jewels themselves these zip sliders are also available for the secret inside pocket fitted within the jacket. The lining features four notches designed to house two watch straps. 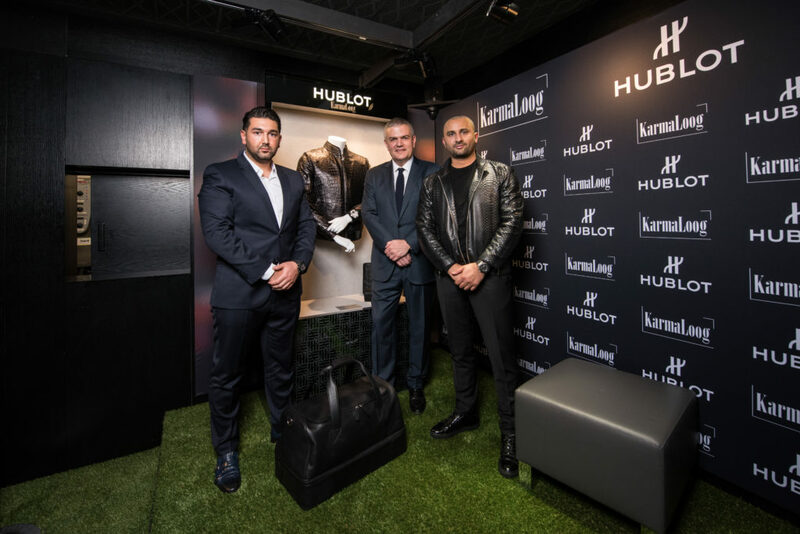 Karmaloog added this design feature as the sleeve of the jacket is equipped with Hublot’s patented “One Click” device enabling the watch face to be attached directly to the sleeve cuff of this jacket, so that the watch can be admired by all. When the jacket is taken off the wearer can bring their choice of straps with them. Just one click and the watch can be moved from the jacket to the wrist, thanks to the integration of the super smart One Click system developed by Hublot! Stylish yet practical. Let’s take a closer look: christened the Hublot Big Bang Tourbillon Croco High Jewellery, it is set with 380 baguette diamonds, cut and arranged to look like scales. They cover the case, the dial and the clasp, in a layout of size and shape carefully designed to recreate the pattern of crocodile skin. 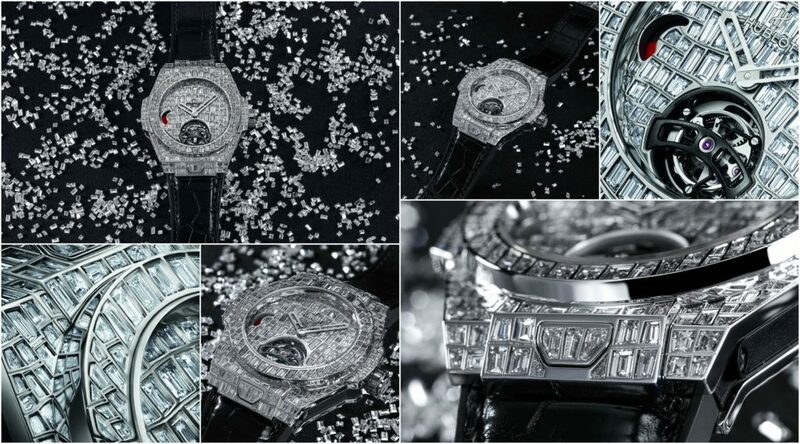 The dial alone is set with 102 baguette diamonds (totalling 4.3 carats). There is an aperture at 6 o’clock opening onto the crowning glory of the calibre HUB6016 movement, a stunning tourbillon. The movement is housed in a case measuring 45 mm in diameter, which is set with another 234 baguette diamonds (totalling 7.6 ct). Self-winding, it boasts an immense power reserve of 115 hours – almost five days! Of course, such a refined piece demands sophistication down to the smallest detail. This is why the clasp on the crocodile strap is also set with 44 baguette diamonds (totalling 1.6 ct). 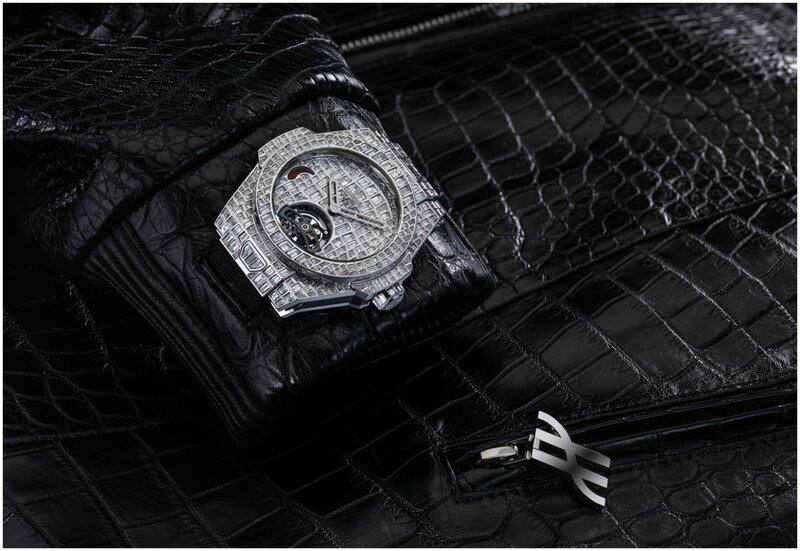 Together, this incredible jacket and Hublot Big Bang Tourbillon Croco High Jewellery watch form a unique combination and deserve a showcase to match: the set is delivered in a black leather sports bag. Inside is a briefcase which houses the watch and can be stored in a safe. It is designed to hold the 9 precious zips, and also contains a second small box with the same dimensions as the secret pocket within the jacket, to allow the watch to be hidden away for safekeeping. Giving you the opportunity to transform yourself into your own luxury armoured vault, this set is the ultimate combination for anyone with a love for ultra-exclusive fashion and accessories! It can be ordered and custom-made for you for the price of one million dollars.